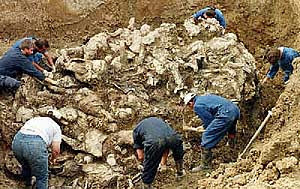 On her second website where they accepeted as some kind of expert for balkan and jew area Julia enlighten us with her latest comment in which she claims that all mass grawes in Croatia and Bosnia and Herzegovina are in fact serbian mass graves killed by Croats or Bosnians. She even pull parallel beatween Serbian and Jews again... but for her "It’s just not obvious enough"
Hm, dead Serbs. Dead Jews. Bad Serbia. Bad Israel. The two pariah states. Land for peace. Land for…well, just give up the land. Gee, I wonder what’s going on. It’s just not obvious enough. To the hundreds of millions who first beheld them on their television screens that August day in 1992, the faces staring out from behind barbed wire seemed powerfully familiar. Sunken-cheeked, hollow-eyed, their skulls shaved, their bodies wasted and frail, they did not seem men at all but living archetypes, their faces stylized masks of tragedy. One had thought such faces consigned to the century's horde of images—the emaciated figures of the 1940s shuffling about in filthy striped uniforms, the bulldozers pushing into dark ditches great masses of lank white bodies. 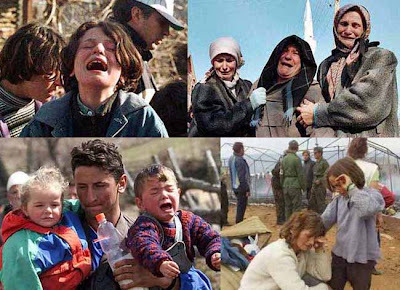 Yet here, a mere half century later, in 1992, came these gaunt beings, clinging to life in Omarska and Trnopolje and the other concentration camps run by Serbs in northern Bosnia, and now displayed before the eyes of the world like fantastic, rediscovered beasts. the Muselmänner, the drowned, form the backbone of the camp, an anonymous mass...of non-men who march and labor in silence, the divine spark dead in them.... One hesitates to call them living: one hesitates to call their death death, in the face of which they have no fear, as they are too tired to understand. Ring a bell?? 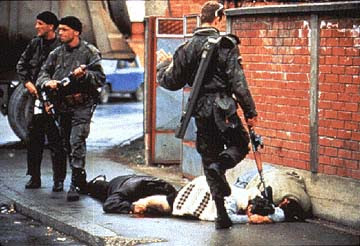 Or still not obvious enough, need a truth about unarmed Serbian people? The substance of the plan was to create a greater Serbia. That RAM was to follow the lines of Virovitica, Karlovac, Karlobag, which we saw confirmed in reality later on with the decision on the withdrawal of the JNA, the Yugoslav People's Army, from Slovenia and partly from Croatia to those positions. The plan...envisaged a division of Bosnia into two spheres of interest, leading to the creation of a Greater Serbia and a Greater Croatia. The Muslims were to be subjected to a final solution: more than 50 percent of them were to be killed, a smaller part was to be converted to Orthodoxy, while an even smaller...part—people with money—were to be allowed to buy their lives and leave, probably, through Serbia, for Turkey. The aim was to cleanse Bosnia-Herzegovina completely of the Bosniak nation. This plan was not fully accomplished, although it is astonishing to think that it might have been. 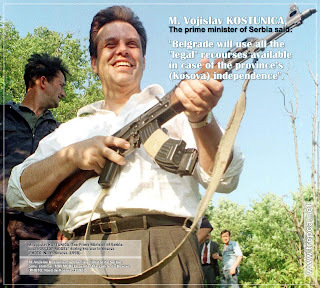 With some exceptions, when the Serbs launched their campaign on March 27, 1992, they chose as their first objective to seize those parts of Bosnia closest to Serbia and to the (now Serbian-controlled) Krajina, regardless of who lived there. Within six weeks they controlled 60 percent of the country, and though they would later increase their gains, occupying, at their strongest, some 70 percent of Bosnia's territory—Serbs made up slightly less than a third of Bosnians—and though the fighting and shelling and skirmishing would go on, the front lines would not change dramatically during the next three years of the war. When the Serb gunners began shelling cities and towns in Bosnia, the pattern of "cleansing" emerged immediately. Army units would form a perimeter around a town, setting up roadblocks. Messages were sent inviting all Serb residents to depart. Then the artillerymen would begin their work, shelling the town with heavy and light guns; if defenders fired back, the Serb bombardment might last many days, destroying the town and killing most of those in it; if there was no resistance, the heavy guns might stop in a day or two. Once the town was considered sufficiently "softened up," the paramilitary shock troops would storm in, and the terror would begin. Like the camp guards—whom they visited when they could in order to take part in torturing prisoners—the paramilitary troops had one responsibility: to administer terror. After a town had been subdued by artillery fire the paramilitaries "mopped up." Many bore on their person all the iconography of World War II "Chetnik" nationalists: bandoliers across their chests and huge combat knives on their belts; fur hats with symbols of skull and crossbones; black flags, also with skull and crossbones; and the full beard, which, as Ivo Banac says, "in the peasant culture of Serbia is a sign of mourning; somebody dies, one does not shave. This was something that happened in times of war...."
Once the war or killing starts it is almost impossible to find out who is telling the truth . without the truth justice can not be found . Serbs Christians know they do not want to live under Sharia law . Most Muslims want Sharia or Islamic law . I believe Sharia is the reason for many of the conflicts where ever Muslims live . So separating Sharia believing Muslim from the other society is the only possible answer .